Application for choosing and matching fonts. Developer website: Random Video, Inc.
Is there a better alternative to PanaFont? Is PanaFont really the best app in Fonts category? Will PanaFont work good on macOS 10.13.4? PanaFont…WHAT FONTS DO YOU HAVE? CAN YOU MATCH THIS FONT? choosing and matching fonts. For most designers it means sorting through hundreds and even thousands of fonts - sometimes with the client right by their side - to find just the right one. PanaFont makes it quick and easy by displaying all the installed fonts on your computer in a unique all-at-once display. 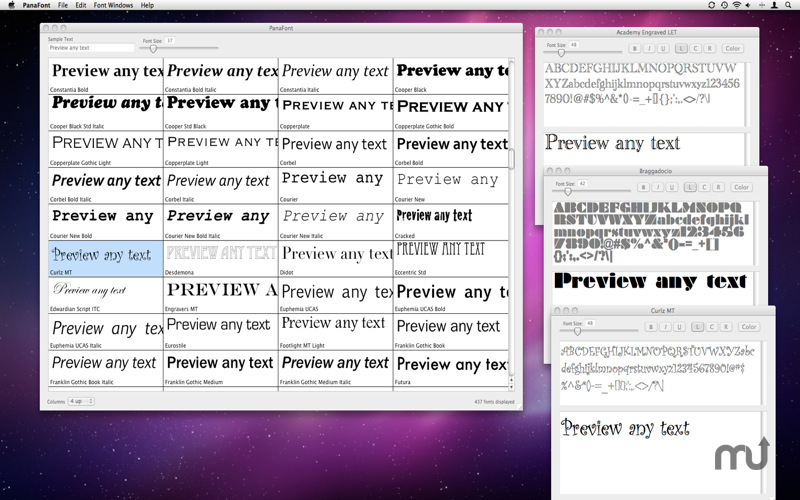 See what your text looks like in any font at any size in a few seconds. PanaFont needs a review. Be the first to review this app and get the discussion started! PanaFont needs a rating. Be the first to rate this app and get the discussion started! Ideal for users of Final Cut Pro, Motion, Avid Media Composer, After Effects, Photoshop, Adobe Premiere or any other graphic or video editing application.